Okay, what’s the context here? Well, it’s twofold: One, it’s this hot and humid Midwest weather that’s caused havoc for green superintendents in their quest to maintain healthy course conditions this summer. And two, it’s the USGA’s new initiative about “brown being the new green” as witnessed with the linksy and firm conditions at Chambers Bay, site of the recent U.S. Amateur. Initially, I thought there was a correlation between the two but after talking to several knowledgeable sources I realize they’re different topics sharing a common concern: good and sensible course conditions. I’ve long been an advocate of using less water on courses, making fairways firm and fast and more fun to play. Is there anything more irritating than having one’s tee-ball stop dead and pick up mud due to over-watering? And why does it invariably happen on a long par four, adding insult to injury? So for me it was especially pleasing to see Chambers Bay set up as a brown, bouncy, firm, links course along Puget Sound outside Tacoma. 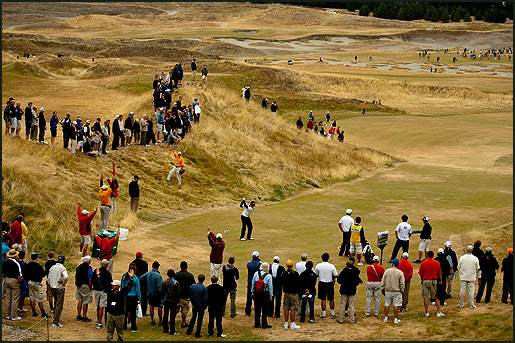 To its credit, the USGA awarded the Amateur (and the U.S. Open in 2015) to Chambers Bay not only due to its links fescue-laden design, by Robert Trent Jones Jr., but also due to it being a daily fee, county-owned golf course. So the USGA earned a two-fer here: supporting public golf as well as a naming a scenic venue with “sustainable” maintenance practices. Well then, is Chambers Bay relevant to Michigan? I posed that question to Greg Lyman, Director of Environmental Programs for the Golf Course Superintendents Association of America. “In terms of a philosophy, I understand and appreciate the direction and efforts of the USGA in ‘its brown is the new green’ initiative,” said Lyman. “But as an agronomist, there are some concerns. First, there are sizable differences in climate and soil conditions for different parts of the country. What works in Washington along Puget Sound may not work in Michigan.” But Lyman readily admitted the side effects of less watering often results in more playable conditions. “Over-watering doesn’t help anyone,” said Lyman. “Too much watering is not good for the turf, makes it too lush and leads to slow play. In fact, golfers generally like firm and fast.” I then asked Lyman, who lives in Lansing and used to be with Michigan State University, if less watering practices would have prevented some of the blight seen this year on Michigan’s greens due to the high heat and humidity. “This summer’s heat wave with high humidity has been out of the equation,” said Lyman. “It’s been so intense. Cool season grasses, like bent and poa annua and rye grasses, have been at the edge all summer long.” Lyman says part of the problem is that many golfers don’t understand the effects of heat and humidity on grasses. “Most golfers understand how cold and frost can damage a green but they don’t have a sense about heat and humidity. “This summer’s been great for corn—a hot weather grass—but not for Michigan golf courses,” said Lyman. One countermeasure to blight is sunshine. According to Kevin Dushane, General Manager of Wuskowhan Players Club near Holland (Mich.) and a former President of the Michigan Golf Course Superintendents Association, morning sunlight is vital to healthy greens. “Dr. Joe Vargas from Michigan State always stressed to me the importance of morning sunlight on greens,” said Dushane. “Morning sunshine to a green is like a nutritious breakfast.” Dushane says his club has removed several trees near its ninth green allowing it more morning sunshine and air as it recovers from a blight brought about by unprecedented heat and humidity. Another problem is that exemplary course conditions are usually associated with the color green, most notably with the Masters and Augusta National. But as we all know, that’s an unfair comparison for everyday courses. Augusta National is an exceptional case, one with unsurpassed resources and with a near tropical growing season. And besides, it’s closed for the summer. With Augusta as an unrealistic standard, making brown the new green is a long shot but it may be worth the effort and the discussion. “We have to shift our thinking from a concern for a lush green appearance to a concern for playability,” said Lyman. “We can’t expect Sunday tournament conditions all season long. It’s just not healthy for the turf. Note: Chambers Bay image courtesy of the USGA; Masters logo courtesy of Augusta National Golf Club. I’m not totally sure I want to see “brown” but I do know I enjoy playing early in the season before the irrigation is turned on and late in the season after the irrigation lines have been blown out. And at my age I need all the “run” I can get!